LCOS - Levelized Cost of Storage for energy technologies version 4 by Lazard in collaboration with Enovation Partners. NEW YORK, December 15, 2016 – Lazard Ltd (NYSE: LAZ) has released its annual in-depth studies comparing the costs of energy from various generation technologies and of energy storage technologies for different applications. Lazard’s latest annual Levelized Cost of Energy Analysis (LCOE 10.0) shows a continued decline in the cost of generating electricity from solar technology, with lesser cost declines in other forms of renewable energy. Lazard’s latest annual Levelized Cost of Storage Analysis (LCOS 2.0) shows cost declines in most battery storage technologies, but with wide variations depending on the type of application and battery technology. In addition, LCOS 2.0, conducted with support from Enovation Partners, builds on the inaugural LCOS study conducted in 2015 with a refined methodology and the addition of new analysis that illustrates and compares the economics of “real-world” energy storage applications. The cost of generating energy from solar photovoltaic (PV) technology continues to decline: The median levelized cost of energy from utility-scale PV technologies is down approximately 11% from last year, and rooftop residential PV technology is down about 26%, although the latter is still not cost competitive without significant subsidies and other policy support. The cost of generating energy from renewable sources other than solar, such as onshore wind, geothermal, and biomass, declined only at the margins from last year, reflecting both the maturing of technology in those areas and a relatively low level of investment. The median cost of generating energy from offshore wind generation declined approximately 22%, but remains substantially more expensive than onshore wind facilities, especially in the U.S. Even though alternative energy is increasingly cost-competitive and storage technology holds great promise, alternative energy systems alone will not be capable of meeting the baseload generation needs of a developed economy for the foreseeable future. Therefore, the optimal solution for many regions of the world is to use complementary traditional and alternative energy resources in a diversified generation fleet. Due to refined methodology for LCOS 2.0, we recommend against making broad cost comparisons to the LCOS 1.0. However, the direct comparisons that can be made show that storage costs are generally dropping. For example, the median cost of using lithium-ion technologies decreased versus last year by approximately 12%, 24% and 11% for peaker replacement, transmission investment deferral and residential use cases, respectively, partially attributable to declining capital costs, among other factors. “Behind-the-meter” merchant energy storage systems, which are sited at factories, universities and hospitals, among other high energy use locations, show great promise. However, their economic viability depends greatly on local market structure and incentives, among other factors. For example, a battery-based storage system that is economically viable in Pennsylvania may not be viable in Texas. Industry participants continue to expect increased demand for energy storage to result in enhanced manufacturing scale and ensuing cost declines. If industry projections materialize over the next five years, cost-effective energy storage technologies will have increasingly broad applications across the power grid, such as providing an alternative to conventional gas-fired peaking plants in certain areas, as well as extending the usefulness over the course of the day of renewable generation such as wind and solar farms. LCOE 10.0 and LCOS 2.0 reflect Lazard’s approach to long-term thought leadership, commitment to the sectors in which it participates, and focus on intellectual differentiation. The two studies are posted at www.lazard.com/perspective. NEW YORK, November 2, 2017 – Lazard Ltd (NYSE: LAZ) has released its annual in-depth analyses comparing the costs of energy from various generation technologies and of energy storage technologies for different applications. Lazard’s latest annual Levelized Cost of Energy Analysis (LCOE 11.0) shows a continued decline in the cost of generating electricity from alternative energy technologies, especially utility-scale solar and wind. Lazard’s latest annual Levelized Cost of Storage Analysis (LCOS 3.0), conducted with support from Enovation Partners, shows declining cost trends among commercially deployed technologies such as lithium-ion, but with wide variations depending on the type of application and battery technology. “The growing cost-competitiveness of certain alternative energy technologies globally reflects a number of factors, including lower financing costs, declining capital expenditures per project, improving competencies and increased Industry competition,” said George Bilicic, Vice Chairman and Global Head of Lazard’s Power, Energy & Infrastructure Group. As LCOE values for alternative energy technologies continue to decline, in some scenarios the full lifecycle costs of building and operating renewables-based projects have dropped below the operating costs alone of conventional generation technologies such as coal or nuclear. This is expected to lead to ongoing and significant deployment of alternative energy capacity. Global costs of generating electricity from alternative energy technologies continue to decline. For example, the levelized cost of energy for both utility-scale solar photovoltaic (PV) and onshore wind technologies are down approximately 6% from last year. Despite the modestly slowing rate of cost declines for utility-scale alternative energy generation, the gap between the costs of certain alternative energy technologies (e.g., utility-scale solar and onshore wind) and conventional generation technologies continues to widen as the cost profiles of such conventional generation remain flat (e.g., coal) and, in certain instances, increase (e.g., nuclear). Specifically, the estimated levelized cost of energy for nuclear generation increased ~35% versus prior estimates, reflecting increased capital costs at various nuclear facilities currently in development. Although alternative energy is increasingly cost-competitive and storage technology holds great promise, alternative energy systems alone will not be capable of meeting the baseload generation needs of a developed economy for the foreseeable future. Therefore, the optimal solution for many regions of the world is to use complementary conventional and alternative energy resources in a diversified generation fleet. Among commercially deployed technologies, lithium-ion continues to provide the most economical solution across use cases analyzed in the LCOS, although competing flow battery technologies claim to offer lower costs for certain applications. Although energy storage technology has created a platform for discussions related to certain transformational scenarios, such as consumers and businesses “going off the grid”, it is not currently cost competitive in most applications. However, under some scenarios, certain applications of energy storage technologies are attractive; these uses relate primarily to strengthening the power grid and accessing cost savings and other sources of value for commercial and industrial energy users through reducing utility bills and/or participating in demand response programs. Industry participants expect costs to decrease significantly over the next five years, driven by scale and related cost savings, improved standardization and technological improvements, supported in turn by increased demand as a result of regulatory/pricing innovation, increased renewables penetration and the needs of an aging and changing power grid in the context of a modern society. The majority of future cost declines are expected to occur as a result of manufacturing and engineering improvements in batteries. Cost declines projected by Industry participants vary widely among energy storage technologies, but lithium-ion capital costs are expected to decline as much as 36% over the next five years. As the energy storage market continues to evolve, several potential sources of revenue streams available to energy storage systems have emerged. However, the ultimate mix of available revenue streams for a particular energy storage system varies significantly across geographies. LCOE 11.0 and LCOS 3.0 reflect Lazard’s commitment to the sectors in which it participates. The two studies are posted at www.lazard.com/perspective. Lazard’s Global Power, Energy & Infrastructure Group serves private and public sector clients with advisory services regarding M&A, financing and other strategic matters. The group is active in all areas of 3 the traditional and alternative energy industries, including regulated utilities, independent power producers, alternative energy and infrastructure. Lazard, one of the world's preeminent financial advisory and asset management firms, operates from 43 cities across 27 countries in North America, Europe, Asia, Australia, Central and South America. With origins dating to 1848, the firm provides advice on mergers and acquisitions, strategic matters, restructuring and capital structure, capital raising and corporate finance, as well as asset management services to corporations, partnerships, institutions, governments and individuals. For more information on Lazard, please visit www.lazard.com. Follow us at @Lazard. The Lazard Levelized Cost of Storage (LCOS) Survey is the most comprehensive survey of project costs in the industry, with over 120 companies participating last year. As expected, the LCOS shows that costs are coming down across most technologies and use cases, with expectations for sustained cost reductions in the next few years. This is showcased through the continued cost reductions of lithium ion batteries, the introduction of promising new technologies such as flow batteries into commercial production, or the revitalization of existing technologies like lead through the adoption of carbon nanoparticles to enhance capability. Cost reduction trends vary across technologies, highlighting a partial lack of standardization in costing and configurations. As we are still in the early commercial stage of technical development, these trends are expected to continue through improved material sourcing and manufacturing improvements. “Soft Costs” – deployment and operating expenses are expected to be significant areas of cost improvement going forward. These falling costs hold the promise of opening up extensive new markets in the coming years – especially for the combined use cases that can greatly enhance the value of deployed storage assets. Based on Enovation Partner’s current research into the C&I market, these cost reductions of storage assets are a key determinate for adoption. 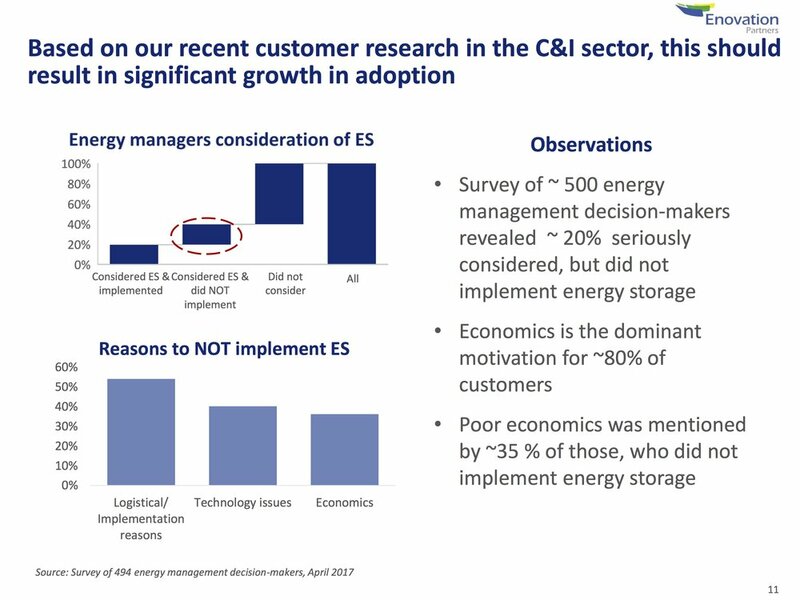 Based on a survey of 500 energy management decision makers, 20% of or respondents seriously considered adopting energy storage systems on site, but did not implement a deployment—with 80% citing economics being the dominant motivation for decisions. Lazard's LCOS 2.0 has been released. Enovation Partners collaborated with Lazard on the methodology and analysis. The first substantial comparison of energy storage costs, technologies, and applications - "Levelized Cost of Storage Analysis" was released on November 18th by investment bank Lazard. The groundbreaking study was developed in consultation and partnership with Enovation Partners. Copyright 2018 Enovation Partners, LLC.